Design Alternatives started out as a leading interior designer in the kitchen and bath arena in Lafayette, IN, but over time we’ve provided many solutions to clients in other areas of the home. We’ve even provided interior design to businesses in Lafayette, IN including offices and restaurants. At Design Alternatives we have over 32 years of experience helping our clients find solutions to the most difficult interior design dilemmas in Lafayette, IN. 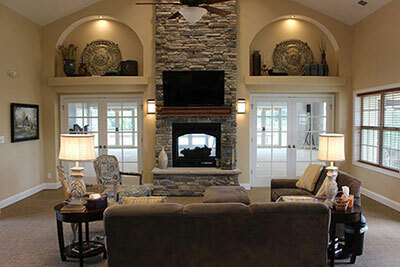 When you contact Design Alternatives you can feel confident because on top of our expertise in designing a variety of projects in Lafayette, IN, we also care about our customers. We know that you’ve probably already shopped and looked for ideas in magazines and on the internet without finding what you’re looking for. That’s why you’ve decided to consult an expert. Because we excel at creative problem solving, we know that the interior design process starts from the moment you call us. That’s why we’ve come up with our in-depth series of design consultations that starts with a phone consultation. We’ll even tell you if we’re not the right interior designer for you and provide you with referrals to other interior design professionals in Lafayette, IN. During your initial inquiry, we’ll schedule a five to ten-minute phone consultation to briefly go over your project, give you a sliding fee estimate based on your project’s requirements, and set up an appointment for an in-person consultation that meets the demands of your busy schedule. If we aren’t the right interior designer to meet your interior design project needs, we’ll refer you to another professional in Lafayette, IN who is. At the consultation, we’ll discuss everything on your list, including answering all of your questions and concerns. We’ll go over potential contractors, give you an estimate of the total costs of your project, and determine if Design Alternatives is the right fit for your interior design project. Here at Design Alternatives, we look forward to hearing from you. We know we can solve all your in interior design dilemmas. Contact us today.